Fly fishing with a rod is at once an art and a science, and what this means for you is that you want to get yourself a rod that matches your personality and your goals as an angler. The selection of the perfect fishing rod is as important to the fly fisherman as the right selection of golf club is to Tiger Woods or Phil Mickelson. With that in mind, the informed angler (that's going to be you when I'm done with you) needs to know about the different kinds of great fly fishing rods out there to choose from. These days, most fly rods are either hand-constructed from bamboo or manufactured from man-made composite materials, including fiberglass, graphite, or graphite mixed with other composites such as boron or titanium. Fly rods are mainly used to go after salmon and trout, although you have every right to use your fly rod to go after other kinds of fish from bass to tarpon. I want to tell you here about the bamboo fly rod. Now one of the things that might make you choose a bamboo fly fishing rod over, say, the much more popular graphite rod or fiberglass rod is its mystical appeal. Once upon a misty time, the Sui River region in the Tonkin area of China's Guangdong Province was the home of artisans who made beautiful hand-crafted bamboo fly rods, and something in our instincts still draws many of us anglers back to that mode of making a rod. So if one of your goals is to be one of the best-looking anglers on the river, the bamboo rod is for you! 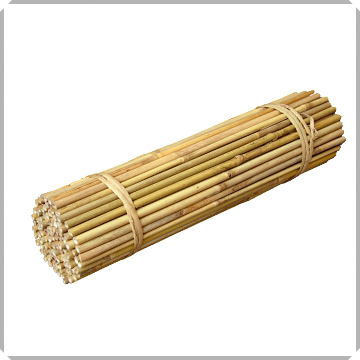 Many bamboo rods are fitted with nickel, bronze, or brass caps and handles to make them even more gorgeous and stylish. The guides of this type of rod are also wound with very fine, almost invisible, silk thread; the rods are finely varnished and fitted with a cork grip and a wooden reel seat. It's just too impressive for words, really. Now, bamboo is a plant that you likely know is common to Asia. But it's not a tree as so many people assume; bamboo is type of grass (family Gramineae, tribe Bambuseae) that has a woody, hard, and hollow stem. In Asia it's commonly eaten! Bamboo has numerous varieties, and they range anywhere from 12 inches to 10 feet in height. Bamboo, needless to say, is not just used for food. It's also used to make some gorgeous stuff, including fly fishing rods. It's amazingly hard and it's good for the environment to use bamboo because it's a material source that's so easily renewed. Bamboo fly fishing rods often take over 100 hours to make, from wood selection to harvesting it, to the handcrafting process itself. 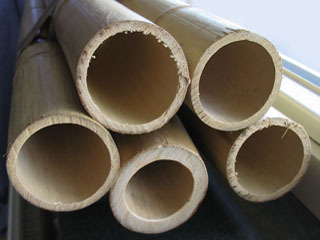 A bamboo rod is typically at least 8 feet long (although there are some in the 6' to 7.5' range) and these rods usually come in two or three pieces to make it easier to carry them. It isn't easy having 8 to 13 feet of wood sticking out when you're trying to board a bus or plane! Another great feature of bamboo fly fishing rods is that while they're very strong and stiff they also have superior flexibility while being lightweight. They can really make a difference in the cast of someone who likes to get a lot of snappy action in when they put their fly out there on the water. 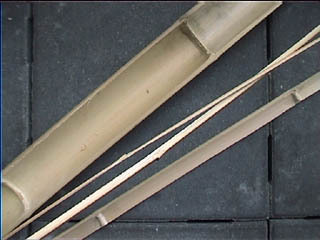 Weightings vary but the typical bamboo rod is in the 4 to 8 range. As a matter of fact, experienced anglers will tell you that the bamboo fly fishing rod's cast is unmatchable and incomparable to any other material. From the breathtaking fluidity of the back cast to the natural dampening effect and flawless alighting of the rod's fly upon the water, nobody has ever been able to invent a more "perfectly" performing fly rod. However, they are also high maintenance, since the materials used to make them are more susceptible to the ravages of wind and weather and splitting or breakage than are synthetic materials. This factor does need to be considered when selecting the kind of fly fishing rod to suit your personality. Bamboo fly fishing rods used to be pretty steep in price, but now you can find high quality discount bamboo rods. It's also possible to learn how to build one yourself--if you've got a hundred hours or so to spare.